This Creamy Paleo Cauliflower Mash recipe serves as a tasty, low carb, easy to make alternative to mashed potatoes. Peel the garlic. I take a huge knife, hold it sideways (flat) and push down on the garlic to break the coating of the garlic. The peel slips right off. 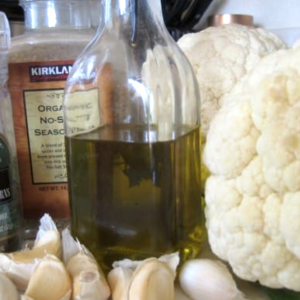 Throw the cauliflower and garlic into a medium saucepan along with about ½ inch of water (or use a steaming basket). Into a food processor, place the cooked cauliflower, whole garlic cloves, olive oil, pepper and salt (optional) to taste. Give it a good whirl until the consistency is smooth.